After a very long week, I ordered myself a pizza from Domino’s – which has become my favorite since they changed their recipe – and had a good, relaxing night in. Stacey's holding the thingy that lets the servers know if you want them to keep bringing on the meat or just let you digest for a bit. After a super awesome 6 mile run, I went to Tucano’s for my first time for lunch. My mom, stepdad, and “baby” sister took me. At Tucano’s you can sign up to receive a free meal during your birthday month. I can’t even describe how much fun this place is. You don’t order anything from a menu except your drink. Then you go to the salad bar and load up on whatever you want, but you shouldn’t load up too much, otherwise you’ll be too full for the best, which is yet to come. As you’re eating, servers come around with various kinds, cuts and flavors of meats. You pick what you want and they put it on your plate. They do this in a circuit, so if you feel like that bacon-wrapped turkey was simply amazing and you’ve got to have more, just wait! This is the tambourine they gave me during my chair dance. 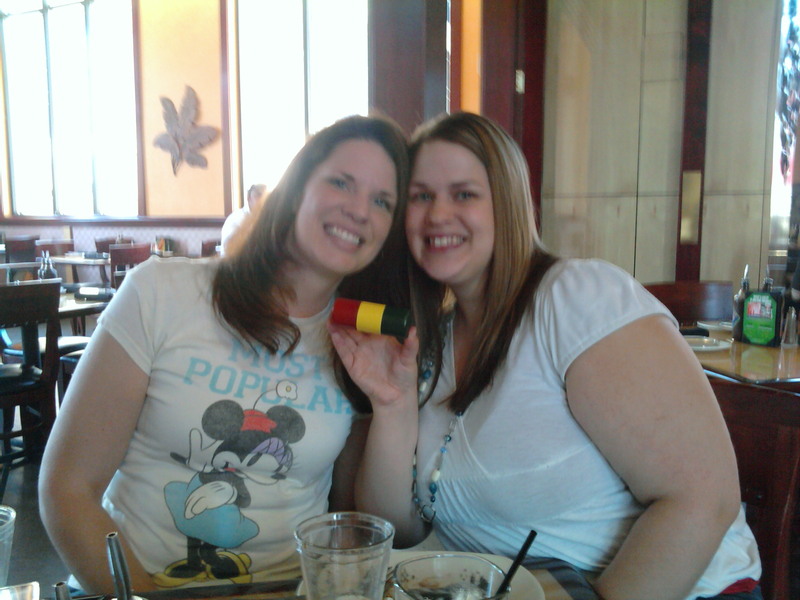 The waitress very kindly let us pose with it. They’ll be bringing more around. The sweet and spicy chicken was one of my favorites, as was the grilled pineapple (I know, pineapple is not a meat. But still). Toward the end of the meal, some of the waitresses and waiters came out clapping their hands and banging drums. They came to my table, asked me to stand on my chair, and handed me a tambourine. 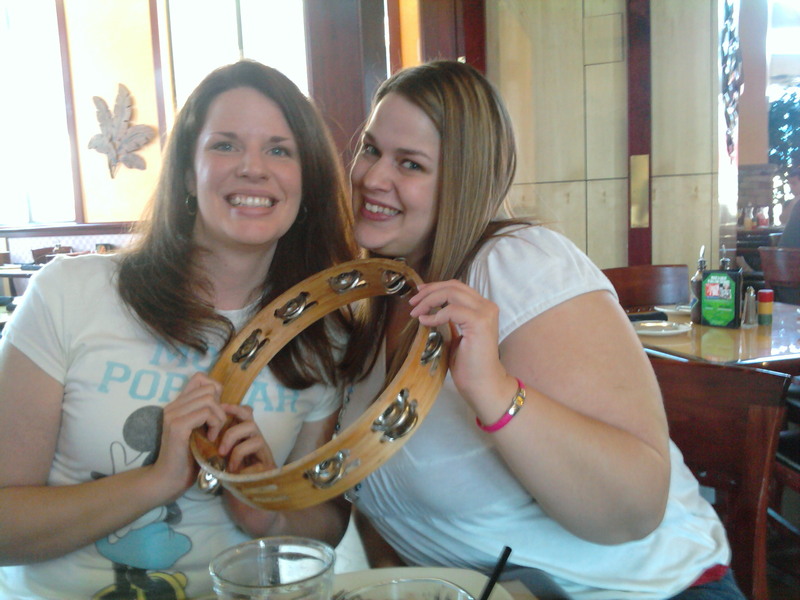 Then they did a little birthday chant as I shook the tambourine while trying not to fall off the chair. It was really fun! But we didn’t think until later that it could have been digitally captured in either picture or video form. Sad not to have that, but Stacey and I got some pictures after. I did end up buying the black ones because I really did need them. 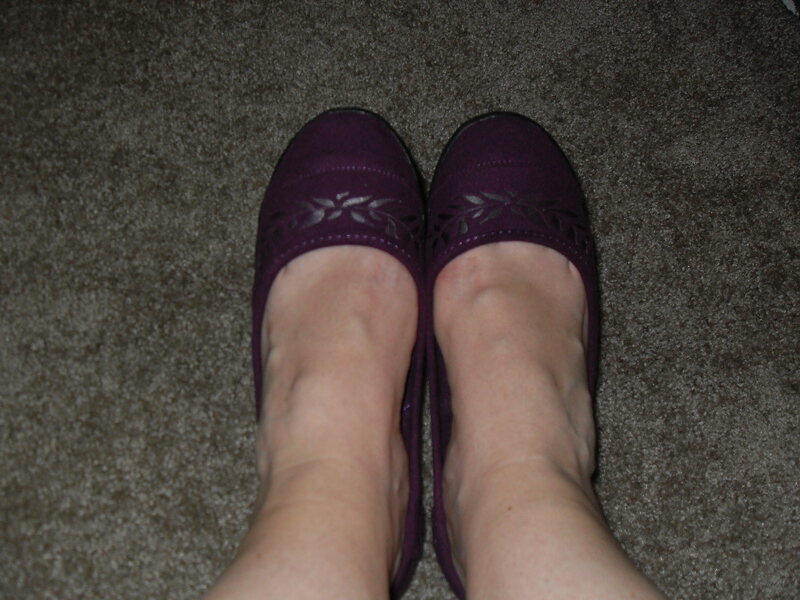 But I also bought some purple ones! Why? Why not? Take THAT, Adultitis!